Are Smartphone and Tablet Users the New Mobile Majority? Increasingly, users prefer using a tablet to consume online content, read books, and play games. The trend is clearly toward touch and emotive content and away from dense text and ad-laden PC browser style content. In my experience, developers and entrepreneurs are still in denial that this mobile, tethered, and touch-centric world is here now. There are the exceptions that clearly “get it” of course, like Path, Pinterest, Instragram, and Flipboard, but it is much more common to find entrepreneurs launching a new product and saying things like “we will solve the mobile problem later” or ” we will convert it to mobile later.” Looking at things that way might work in the enterprise, but not for consumers. It’s way too late to still be considering mobile the exception, something to be dealt with “later” but I find it all the time among developers too (another entire blog post of its own). Even apps or web sites that embrace mobile often don’t go far enough. Many still take the approach of leaving certain features and functions out of the mobile version. This applies even to many larger, well-known services (Facebook comes to mind). They model their interface on the assumption that the user will perform some operation or task “later” when they get back to their PC. That is fundamentally an archaic model. The is no “later” in the post-PC era in which we now live – Many users don’t have a PC at all, or don’t use it any more. 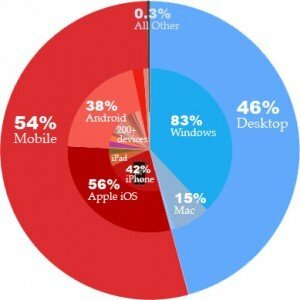 Of those people that have PCs, many would prefer not to use it – they want to use your service on the device they choose, which increasingly means their smartphone or tablet, not the device your service forces them to use.